But good news doesn't stop there. Glancing through the S family and other device lines we see a lot more confusing information. The Galaxy S5 Mini is among the devices listed as waiting for the Lollipop update, but the entry for its bigger brother, the Galaxy S5 states "no information" for next update.Samsung Galaxy Alpha is also on the list and so is the Galaxy S4, which is in pretty much the same shoes as the Note 2 in terms of support. A webpage from Samsung’s official website has surfaced which lists all the devices which are bound to receive the Android 5.0 Lollipop updates. We weren’t surprised to see the names of the devices like the Galaxy Note 4 and the Galaxy Note 3 as it was expected, but the name of the 2-year old Galaxy Note 2 really surprised us. This should bring a large smile on the faces of the Note 2 users. The good news doesn’t stop there, as the Finland section of the website has also listed the Galaxy S5 Mini as the contender to receive the most recent version of Android dessert. Other devices which were listed on the webpage include the Galaxy Alpha and the Galaxy S4. We had already showcased videos of Android 5.0 Lollipop running on various Samsung smartphones including the Galaxy S5, Galaxy Note 4, Galaxy Note 3, and the Galaxy S4 Google Play Edition. Como penso que sabes, não são aceites tópicos num idioma diferente do português. Ainda assim e pela importância da informação, peço-te que para a próxima traduzas o que estiver ao teu alcance. Caro moderador sei disso e postei na língua original porque a uns tempos traduzi um anúncio do género e só se meteram as bocas e esse o motivo..
Espero que a actualização oficial chegue rapido, estou morto para testar o novo touchwizz. How often have you heard of an Android device that’s more than two years old get an official update to a major new version of Android? Outside of Google’s Nexus lineup, it’s not something that has ever come to pass – every flagship out there usually gets one or two major updates within 2 years after they go up for sale, after which the device manufacturer moves on to newer devices. And you can’t blame them, considering how many devices they churn out every year. With the Galaxy Note II though, Samsung might just be about to do what no other manufacturer has done. Samsung Poland recently confirmed that the Note II would be getting an update to Lollipop, and Samsung Finland also says the same on its support site. The Note II launched with Android 4.1.1 out of the box, and since its launch, has been updated to Android 4.1.2, 4.3 and 4.4.2. If that wasn’t good support already for an Android device, it looks like Samsung isn’t done with its second-generation Galaxy Note flagship yet. Samsung has often been criticized for being slow with rolling out updates to devices, though what most fail to understand is that for a company with so many phones and tablets and software that has a ton of features, the Korean manufacturer is actually rather fast. With Lollipop, we’re seeing Samsung update a new device every other day, even making these updates widely available in a short span of time instead of keeping them limited to a region or two. 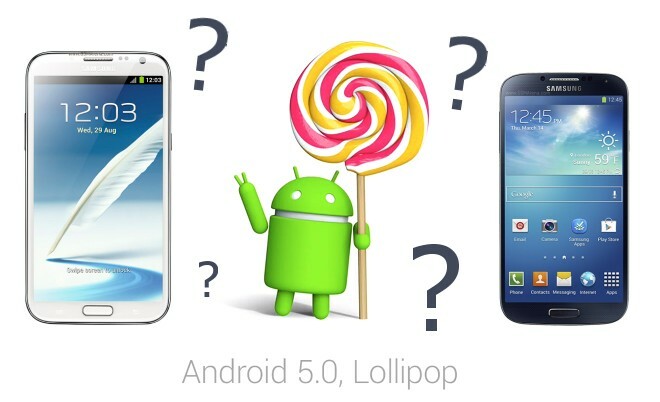 If the Galaxy Note II really is going to get Android 5.0, it would be a very impressive move from Samsung. The Note II has been available for purchase for around two years and five months now, and by the time the update would arrive, it will probably be pushing more than two and a half years of existence on the consumer market. Even Google doesn’t usually update its Nexus devices after two years – the only advantage the Nexus devices have is that since they get updates faster, they usually get more updates within the same time as a non-Nexus device. But in terms of the period of support, Samsung seems set to create history in the Android ecosystem, and while it might not be at the level of what Apple offers in terms of software updates, it still goes to show that Samsung is doing what no other Android OEM has done yet. Though we certainly hope they follow Samsung’s example, and that Samsung would show the same support longevity for some of their other phones. We could all do with some solid software support on devices that are an important part of our daily lives, and we have our fingers crossed that this show of love for the Galaxy Note II is not just a one-time thing for the Korean manufacturer. Update: The article has been updated to correct an issue regarding the upgrade path for the Note II. Thank you “SERILTHAS” for pointing it out! 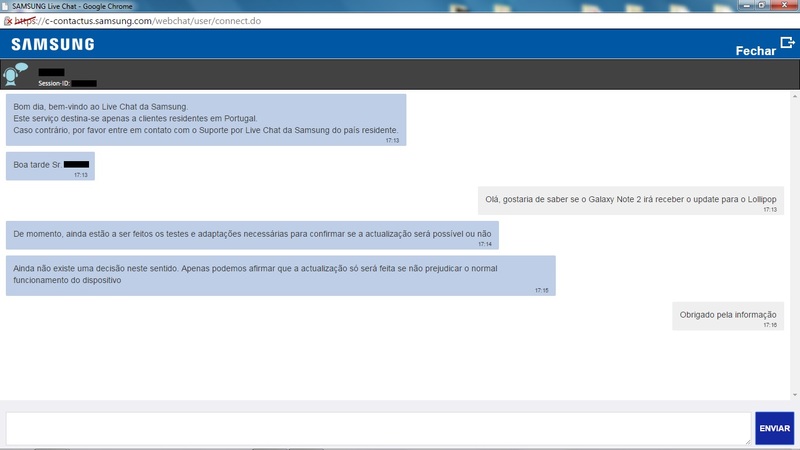 O update para o Note II vai ser disponibilizado apenas para algumas regiões, e ao que parece a Samsung Portugal ainda não tem a certeza se vai ou não disponibilizar o update (screenshot anexado). Editado por PedroBlackCool, 08 May 2015 - 23:20.
já alguem sabe mais novidades do lollipop para note 2 n7105?